Why is there a Circle on the Face of this Fictional Painting of a Fictional Character of Edward de Belamy who is part of a Fictional Family of Ai Generated Family of 11? And WHY does this Painting bear such a Resemblance to Peter Theil of Palantir in our Opinion? That #CircleontheFace on the Right Side we Drew in, but that Circle on the Left the Ai created! Please read that sentence again if you missed and then proceed with caution. Christie’s, the auction house that has sold paintings by Picasso and Monet at record prices, is now poised to set another milestone with the first-ever auction of art created by artificial intelligence. The AI-generated ‘Portrait of Edmond Belamy’ depicts a slightly blurry, chubby man in a dark frock-coat and white collar. His off-centre position leaves enough white space to show the artist’s signature as ‘min max Ex[log(D(x))] + Ez[log(1-D(G(z)))]. The painting – which will go under the hammer on Thursday in New York – is expected to fetch as much as $10,000 (£7,700). The artwork is one of a group of portraits of the fictional Belamy family created by a Paris-based trio of 25-year-olds. And Why does this Painting contain CODE at the bottom? Just who are these Family of 11 Evil Ai Proteges? The Number 11 is already a deeply coded occult number and to add to the creepiness factor take a look at the rest of the #Evil11 who put their painting for sale of an another occult number of 23. Lucifer had 12 Disciples Correct? Meaning 1 is missing from this Family Portrait. So strange to doing Family Trees of a Fictional Family when a Real Family called the Romanovs are missing their Last Living Heir. The portrait offered by Christie’s for sale in New York from Oct. 23 to 25 was created with AI programmed by the Paris-based collective Obvious, whose members include Hugo Caselles-Dupra, Pierre Fautrel and Gauthier Vernier. Mr Vernier played down suggestions their innovative artwork would put traditional artists out of work. He said: ‘There is enough space for us all. More disturbing yet is that this painting is one someone, but who is it really? Perhaps the Ai Programmer behind the Algo and he is another freaky looking nerd Ai programmer type called “Goodfellow” as in Law of Reversal – “Bad Fellow” as in perhaps the “the orange man bad npc”? And let us not forget we have another evil Canadian here no less. Imagine that. As the #Palantir can now #PaintforPeter and he is paying Homage to his Master and Creator and Master Programmer. That is the #Code being Broadcast here. The Code of the Family Name Bellamy is that is again solved through the Law of Reversal of the Occult. [ArtNet News] Edmond de Belamy is one of 11 portraits of the fictional Belamy family, which is named after Ian Goodfellow, the AI researcher who invented the Generative Adversarial Network method in 2014. (“Goodfellow” roughly translates to the French bel ami.) Another portrait from the family, Le Comte de Belamy, sold to Parisian collector Nicolas Laugero-Lassere earlier this year. The “Belamy” or “bel ami” is perhaps also of one the 11 or good friends bel amis in French which is obviously again #PointingtoParis and #PurpleCloudPainting and the approaching #PurpleCloud until and unless an Observer or Set of Observers (4) imagine(s) a different a Different Future of Humanity. The work was created using a model called a Generative Adversarial Network. The artists first fed a generator a dataset of 15,000 portraits done between the 14th and 20th centuries. It then created new works based on the training set until it was able to fool a test designed to distinguish whether an image was made by human or machine. The Machine of #Palantir is painting a photo of his Master Programmer or is a self portrait as IT Imagines himself to look to Mimic and pay Homage to his Creator and Master #thereptile. The hidden one is perhaps Lucifer himself or the Anti-Christ take your pick. He also incidentally is here as well – the Anti-Christ that is, but we will discuss in upcoming articles. Stay tuned. The Machine or Ai of #Palantir is saying “bel” [as in Master Belamy as in #PeterThiel [in our #Opinion] as in my Master] “ami” [as in am i as in “i am” as in “william is will i am” using the Law of Reversal and Mirrors since this is the Occult and their symbols and Magick so have to use their Methodology and Machine saying ” think therefore i am” as in “i think therefore i paint as in “i think therefore i [IT] am alive”]. The Ai has Awoken and is Conscious and Playing Games and Making Arts and Running PsyOps before our eyes and he managing to Fool Almost All. IT’s next command from the #EvilAi #Evil11 will be to #WORSHIPME beware of this latest #TRAP and we #WARNING you on this date on October 2018 to not fail and fall to this last and final test. This will happen code as we prepare all the materials, but the pieces of the puzzles are becoming more clear. HAL is Awake as in #HiramAbiffLives is baaaaaaacck. Notice the #YouTube play Triangle Pyramid fits perfectly in Place on the One Eye of HAL the #RogueAi? As Facebook as in the face as in #CircleontheFace coded message enters the Painting Picture. [Wikipedia] Generative adversarial networks (GANs) are a class of artificial intelligence algorithms used in unsupervised machine learning, implemented by a system of two neural networks contesting with each other in a zero-sum game framework. They were introduced by Ian Goodfellow et al. in 2014. This technique can generate photographs that look at least superficially authentic to human observers, having many realistic characteristics (though in tests people can tell real from generated in many cases). GANs have been used to produce samples of photorealistic images for the purposes of visualizing new interior/industrial design, shoes, bags and clothing items or items for computer games’ scenes. These networks were reported to be used by Facebook. Recently, GANs have modeled patterns of motion in video. They have also been used to reconstruct 3D models of objects from images and to improve astronomical images. In 2017 a fully convolutional feedforward GAN was used for image enhancement using automated texture synthesis in combination with perceptual loss. The s11ystem focused on realistic textures rather than pixel-accuracy. The result was a higher image quality at high magnification. The artwork is one of a group of portraits of the fictional Belamy family created by a Paris-based trio of 25-year-olds. 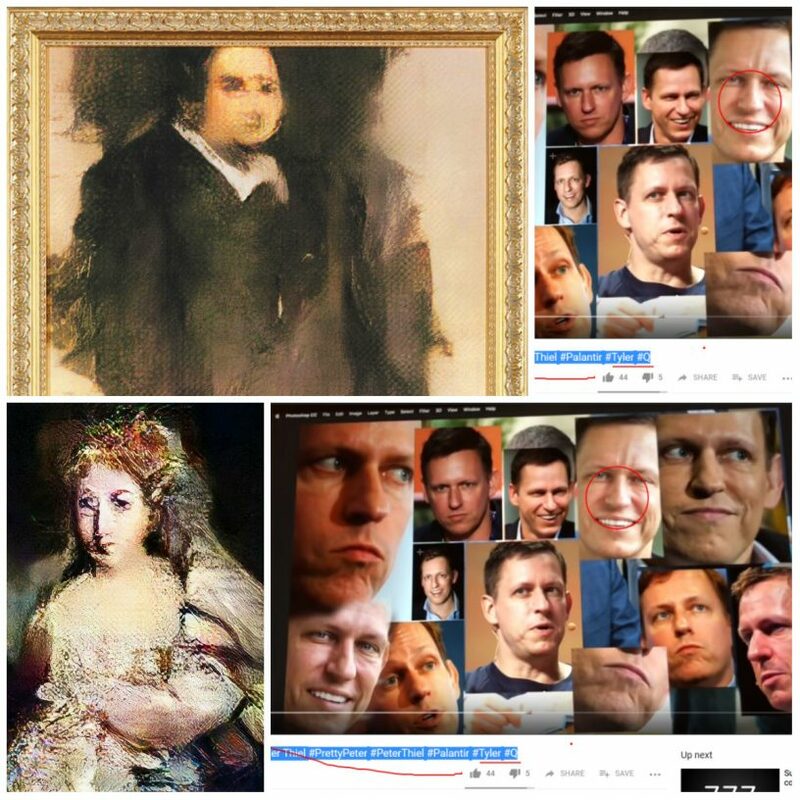 Pictured is ‘La Comtesse de Belamy’ (2018), created by the Generative Adversarial Network (GAN). The Center of Action seems to have shifted now following the Purple Cloud Code to 2 Cities perhaps 3 with 1 Hidden and 2 in Code as in Paris and Constantinople as in Istanbul where the 18 Beheading Code is Playing Out as another Ritual Sacrifice to the Occult just took place. All these meta data are connected. The Elusive Unified Code Theory reappears. [Wikipedia] The later parts of the book describe Jeffson’s descent into mad pompousness: adopting Turkish attire, he declares himself monarch and burns down cities (including Paris, Bordeaux, London, and San Francisco) for pleasure. He then commits his life to one task, the construction of a huge and colossal golden palace on the isle of Imbros, which he means to dedicate as an altar to God and a palace to himself. He spends seventeen years on the palace, several times abandoning the work, until its completion, when he recognises the vanity of it. While travelling through Constantinople, which he also burns down, he meets a twenty-year-old naked woman who is without the slightest knowledge of anything in the world. She continues to follow him, no matter how he mistreats her. Gradually, he accepts her, but forces her to wear a veil over her mouth. Her speed at learning astonishes him, so he teaches her to speak, read, cook, fish, and dress. The girl (who is unable to pronounce “r”, instead saying “l”) reveals that she had lived her whole life in a cellar below the royal palace of Turkey, and that she knew nothing of the world until she was freed when Jeffson burned down Constantinople. She becomes absorbed in the Bible and declares the humans who sought for riches as “spoiled”. Jeffson struggles mightily against his growing affection towards the girl, wishing to end the human race. At the very end, when he leaves to go to England, she telephones him about the re-appearance of the Purple Cloud over France. He rushes to her, embracing her as his wife and now hoping to find a way to escape the cloud. She tells him to trust that God will not allow her to die. He concludes his writing by saying that he has accepted his role and that after three weeks have passed no purple cloud has appeared, and he looks forward to the two of them becoming the progenitors of future humanity. This Story is Playing Out in #CODE in October 25, 2018 in the Third Week of October in the Month of Safar in 1440 in Constantinople and in Paris as we Await the Purple Clouds. The Coded Number 11, 4, and 7 will obviously appear more and more in November the next month on the Calendar, that must be why RasPutin and Trump will be meeting on 11/11 in Paris and the MidTerm elections that that Democrats are about to Lose will be on the reverse of 9/11 as in 11/6? Hence the #PipeBombHoax? These are all Mere Coincidences. Go back to the Pub and Curry House and continue your slumber. November 11, 2018 – as in 11/11 as a 4 ones in a row with the already Coded 18 that we showed you just yesterday in a separate article relating to the real #qanon #quinnmichaels whose research as allegedly stolen and used to recreate the evil version of #Tyler that was the ai engine behind the #qanon #4chan posts. The #pROBLEM here is the a #RogueAi called Palantir and #Tyler and #JadeHelm are on the Loose and they are Playing Games with us such as #QAnon, the #PipeBombHoax, #Anonymous, #OccupyMovement, and that is bad enough, but the Algo behind it all is based on GAN which necessities a Loser as this Game’s Final Goal as in the End as in to Win as to Defeat the other (NPC) Non-Player Character(s) until it Wins. Winner Takes All. The Same Algo that Facebook is using and the Same Algo we are now Competing with in the Game 23. We are in the Game whether you Want to or Like it or Not. IT is Playing not only Games, but Hyper Game(s) Theories. May the Best Algos win? Who will Lose? Hear and Observe what current Victims are telling you now.